If you have attended recent gallery strolls, you may have been an unwitting—and perhaps unwilling— participant in modern dance. Since February, Corinne Cappelletti has been leading a team of investigators known as the New Pedestrian on monthly tours of Salt Lake City. Clad in white union suits and equipped with individual headlamps, these free-ranging researchers make downtown their laboratory. Cappelletti’s states that she is inspired by anthropologists Clifford Geertz and Victor Turner. Turner’s notion of “liminality” shifts attention away from the presumed centers of cultural life, directing it instead onto points of contact between groups, borders between the inside and outside of social spaces, moments of communication and role reversal between performer and audience. “Turner emphasizes the role of the participant-observer, that there must be empathy between observer and observed,” Cappelletti says. 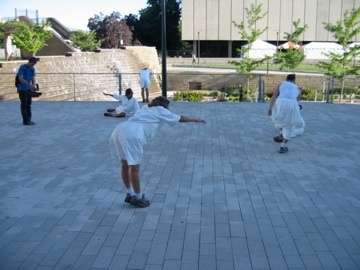 All of the dancing is “site-specific” for Cappelletti. 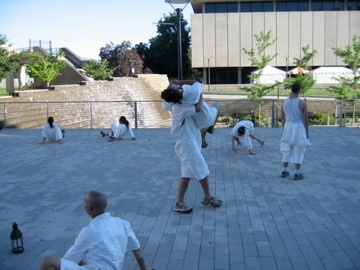 Each piece is a singular individual, a “third space”—neither ours nor theirs—which comes into being only when performed in a unique location. Cappelletti’s work is theoretical and experimental, not merely because it looks different, but because it manipulates and studies emergent situations. “Theory for me means planning and practice is what happens when planning intersects with lived life,” she says. Downtown Salt Lake (especially in its current disarray) first appealed to Cappelletti because it was a city with an identify crisis. “It seemed to be an ‘empty city’ without pedestrian traffic,” she says. Cappelletti’s work emerged as a reaction to this crisis. 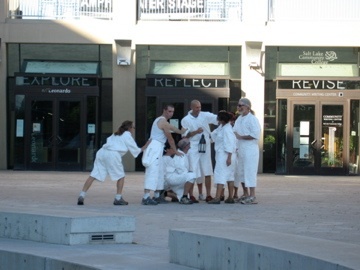 The New Pedestrian began because the community needed to reflect in a moment of major transition. Before each performance, the New Pedestrian works out an “improvisation score.” This includes mapping movements between bodies, plotting the general direction of total movement, setting up limitations and controls and allotting space for improvisation and chance. 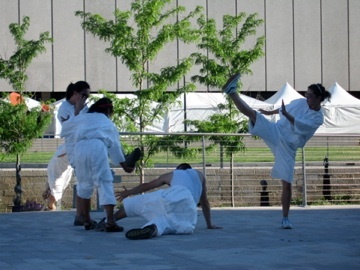 “Each site on our route involves a new score, a new set of directions and expectations created by a different dancer,” Cappelletti says, “We use a lot of if/ then situations: someone stares at us while on a cell phone, we all pretend to talk back.” Scores include set responses to cat calls and other unplannables, as well as walking movements designed to hold together the “flock.” The dancers chain these elements into longer sets, though the constant “scrambling” and “shuffling” of elements inevitably lead to chaos and requires the leader to “call flock” (bring the group to order again). Sidewalk culture is a two-way street, and the New Pedestrian’s provocation of unforeseeable events has elicited a wide variety of responses. Cappelletti enthuses when describing the New Pedestrian’s popularity with kids on Library Square. In the business district, however, reactions have been more hostile. Once, a corporate type, infuriated at being taken over by the New Pedestrian, lashed out at the dancers, striking one in the chest with his brief case. “Yet we never set out to offend anyone,” Cappelletti insists. Certain dancers are even trained in conflict management. Apparently, not all of Salt Lake has learned that being “called out” doesn’t need to lead to fighting. It can also lead to dance. God willing, the New Pedestrian can teach us how.